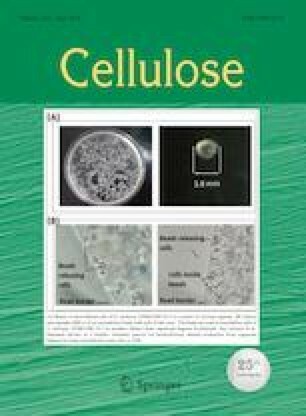 The present work describes the production of novel highly hydrated cellulose microfibrils (CMFs) with unique morphology from coffee pulp waste using specific chemical treatments. The as-produced CMFs were successfully characterized and then used as an adsorbent for removal of methylene blue (MB) from concentrated aqueous solutions. 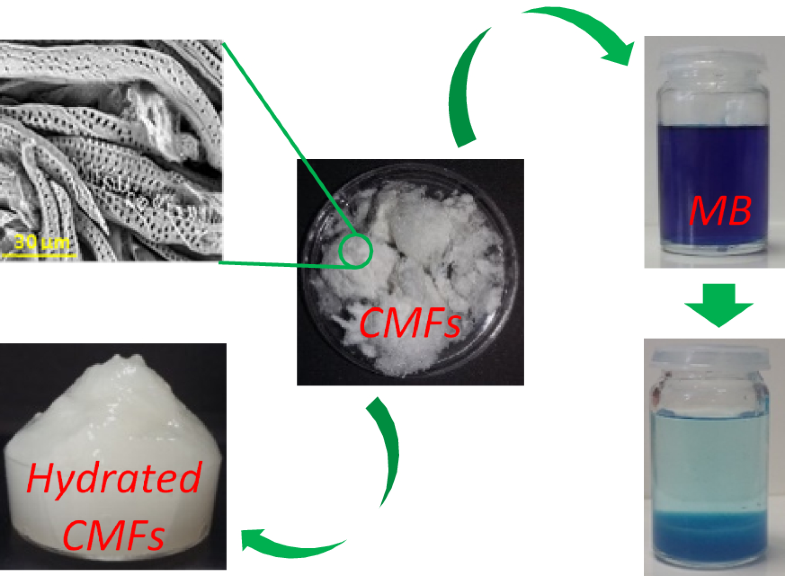 Surprisingly, it was found that the novel CMFs display high water-uptake ability, with a maximum swelling ratio of 265%, and that they form an entangled hydrated network gel in water. The morphological observation and nitrogen adsorption measurement demonstrated that the extracted CMFs exhibit an average fibril diameter of 11.5 µm and mesoporous structure with an average pore size of 6.37 nm. These special features make the as-produced CMFs excellent candidates to be used as adsorbents for removal of MB from concentrated solutions. The performed adsorption studies determined that the adsorption equilibrium was reached within 90 min. The adsorption kinetics data were well fitted to the pseudo-second-order kinetic model, and the adsorption isotherms were well described by the Freundlich isotherm model. In addition, the maximum adsorption capacity was 182.5 mg/g, much higher than that determined for other previously reported cellulose-based adsorbents. Through this study, we have demonstrated a possible strategy to give an added value to the coffee pulp waste, a by-product of the coffee processing industry, which is rich in cellulose, inexpensive and renewable source. Indeed, the extracted CMFs are very attractive for developing a sustainable and economically viable bio-sourced material for future growth of cellulose use in advanced applications. The online version of this article ( https://doi.org/10.1007/s10570-019-02344-w) contains supplementary material, which is available to authorized users. The financial assistance of the Office Chérifien des Phosphates (OCP S.A.) in the Moroccan Kingdom toward this research is hereby acknowledged. The authors would like to thank Pr. Jones Alami, head of Materials Science and Nanoengineering (MSN) Department of Mohammed VI Polytechnic University (UM6P), for his help to improve this work.